The Rhythm of the Remedy | Ukulele Kids Club Inc.
UKC is so proud of the extraordinary accomplishments of Stephanie Epstein, MM, MT-BC@ Holtz Children’s Hospital, as well as in her capacity as Music Therapy Advisor to the Ukulele Kids Club. Stephanie is raising the national bar for Music Therapy Advocacy by example in her work and passion for healing, and through the profound science of Music Therapy… every single day! Congratulations Stephanie! Board certified music therapist, Epstein, M.M. 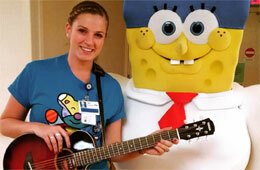 ’14, MT-BC, developed the in-patient music therapy program for Jackson Health System’s Holtz Children’s Hospital. She also established and manages the music therapy options at Jackson Pediatric Center–Prescribed Pediatric Extended Care (PPE). Coral Gables, Fla. (August 8, 2015) – On any given day, Stephanie Epstein can be found with a ukulele, keyboard or sound system crowding her desk. All necessary tools that come with the territory of music therapy. As a board certified music therapist, Epstein, M.M. ’14, MT-BC, pictured above right with patient Brandon, was hired to develop the in-patient music therapy program for Jackson Health System’s Holtz Children’s Hospital. She also established and manages the music therapy options at Jackson Pediatric Center – Prescribed Pediatric Extended Care (PPEC), a facility that provides medical care for children with chronic illnesses who require daily ongoing nursing care. Music therapy involves the therapeutic application of music and music-based experiences to help regain or develop important life skills, including communication, physical movement, attention and memory, emotional growth or social skills. For children who are hospitalized, music therapy has the added benefit of helping them work through the emotional aspects of illness and of being hospitalized. Upon graduating with her Bachelor of Music in Music Therapy and Music Education from Nazareth College in Rochester, New York, Epstein completed a six-month internship at Golisano Children’s Hospital – part of Strong Memorial Hospital at the University of Rochester Medical Center – which allowed for board certification and a position as a long-term substitute music therapist. It was while she worked there that Epstein received her acceptance to the University of Miami Frost School of Music as a Graduate Teaching Assistant, allowing her to pursue her graduate studies in Music Therapy. The Frost School trains music therapy students to work with individuals of all ages who require treatment, but at Holtz and PPEC, Epstein’s pediatric patients range in age from newborn to 21 years old. Think of music therapy as physical therapy for the whole person. Unlike the weights, dips, lunges, and seemingly endless repetitions of physical activity, the instruments of music therapy massage different muscles and allow for the processing and healing of emotions, communication, cognition, or physical health. The melody of each chord progression played is a reawakening of the senses, the patient a musician composing the notes of their own recovery. Epstein’s work is about putting clinical, non-musical needs first and acts as a procedural support for her patients. “That’s where music therapy and music education differ. Therapy helps them relax, not learn the skill,” Epstein said. Very rarely do her patients request music lessons. When the mundane administrative tasks of tending to mounds of paperwork, the umpteen to-dos of program building and layers of grant writing begin to weigh down on Epstein’s shoulders, she opts for the hands-on work of playing instruments with her patients on the floors. And every obstacle has its reward. When Epstein was just starting out with the PPEC program, she reached out to the non-profit Ukulele Kids Club, Inc. (UKC), an organization that donates ukuleles to children’s hospitals nationwide for their music therapy programs. The ukulele proves itself a kid-friendly instrument, with four nylon strings compared to a guitar’s six. The smaller size makes it easier for young patients to learn chords, plucking away as they play. At Holtz, Epstein has received ukuleles for at least 30 of her patients. She now also serves as the music therapy advisor for UKC. While most days in the pediatric wards are happy and uplifting, with Epstein regularly greeted by a toothy, smiling patient grinning at her from their hospital bed, there are days when a patient is near death or is taken off life support. That’s when patient families request that Epstein be in the room to play. “In that sense, music therapy can also serve as a beautiful memorial,” Epstein said as her voice broke slightly. Epstein credits her professors and courses at Frost to her post-graduate success. In November, Epstein will participate in a panel discussion of trending topics in music therapy at the 2015 American Music Therapy Association (AMTA) National Conference in Kansas City, Missouri. She will also present her thesis findings, “The Relationship Between Music Therapy Graduates’ Perceptions of Undergraduate Curricula and Graduation Outcomes,” during a research poster session. As the demand for music therapy at Holtz increases, Epstein plans to pay it forward and bring in Frost Music practicum students for clinical training, beginning Fall 2015. This story was written by Megan Ondrizek, University Communications, University of Miami.